During the decade or so that I’ve been blogging I’ve usually steered clear from writing about “personal development”. I’ve concentrated mainly on solid business subjects. 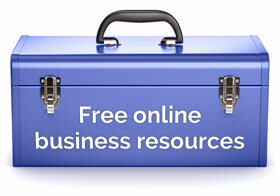 However, business affirmations are in an interesting area where business and personal development coincide. It’s woo-woo. Will people take me seriously as a business blogger if I write about this? I’m not on solid ground here. I’m outside my comfort zone. Your attitude to affirmations really comes down to whether you have a “fixed mindset” or a “growth mindset”. A person with a “fixed mindset” would say that things are the way they are and you can’t change them. 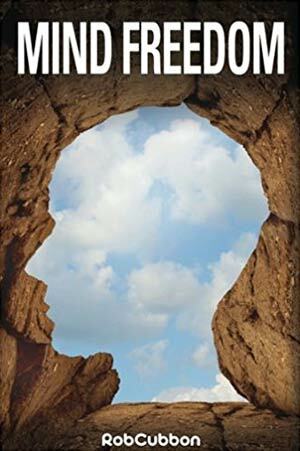 A person with a “growth mindset” will more readily believe that we create and improve our own realities. The idea that we create our own reality isn’t a new one (or only a New Age one). 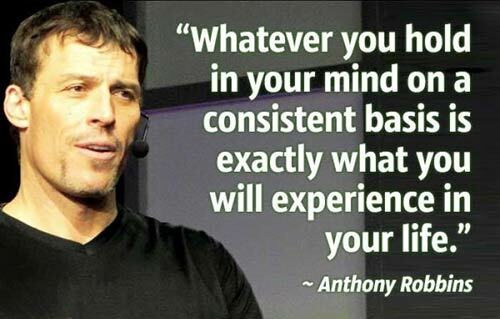 “Whatever you hold in your mind on a consistent basis is exactly what you will experience in your life” is a quote by Tony Robbins that I find particularly powerful. I have kept this little image on my desktop for the better part of a year. It’s a perpetual reminder to keep to a “growth mindset”. Remember, your thoughts create your feelings, your feelings create your moods. And positive and happy people will always attract positive and happy people and outcomes to their lives. As far as I’m concerned at least, your thoughts ultimately form your life. I could reel off psychological studies into the brain’s elasticity and even the evidence on a deep subatomic level of observation causing reality . But ultimately, you either believe in affirmations or you don’t. Or, at least, you have to believe that they’re worth a try for them to work. They are a proven method of self improvement or a classic example of New Age baloney, depending on your point of view. I’m prescribe to the former rather than the latter. Affirmations are positive phrases or sentences that are either said or thought. They may be a goal that you want to become real. 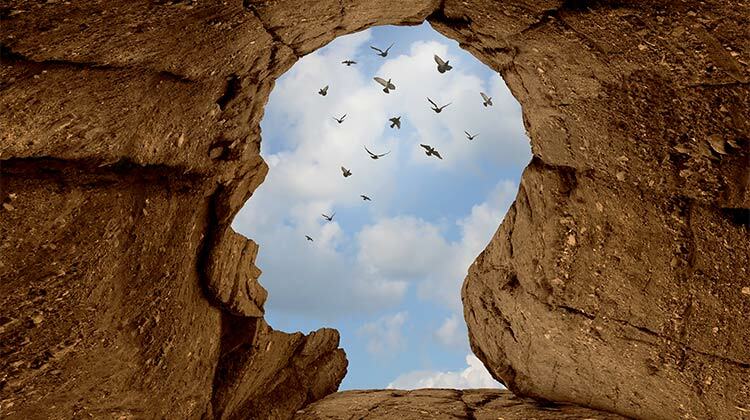 Affirmations can eliminate negative beliefs, problems with addiction or trauma, and, more importantly, they can actually affect your life materially. You can affirm yourself increased income or a new partner. And, believe me when I say this, ALL my affirmations have come true. That is a very bold (and italicised) statement. But, it’s true. Only a few people will read this article. Fewer still will appreciate the importance of what’s being said here. And fewer still will take action. But I need to say this. But, be careful! 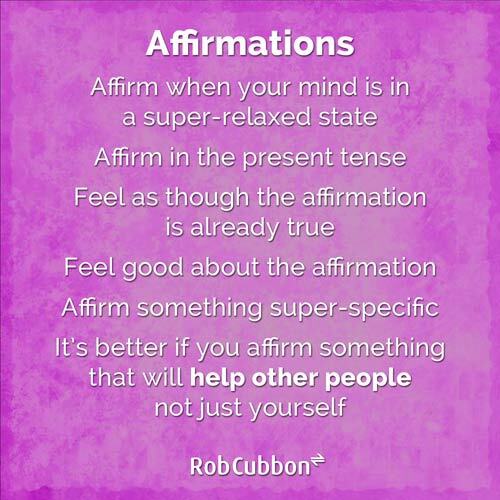 If you really believe in affirmations then you have to think very carefully about what you want to affirm. Be careful what you wish for. Sometimes we don’t always want what we think we want! Please read to the end of this article before you do anything! The process of setting affirmations increases self-knowledge. Imagine: you can get anything you want just by saying it. This is powerful stuff, so you need to think very carefully about what it is you want. Most people say “I want more money” and leave it at that. But “I want more money” is a terrible affirmation on a number of levels. Firstly, it’s too general, affirmations need to be more specific. Secondly, it’s too self-focussed, affirmations are better when they involve you and your family, community, colleagues, the world, the universe. It’s not all about you! And lastly, “I want more money” is a terrible affirmation because it’s a wish and not a statement. “I am rich” would be better but you need to believe affirmations to be true and if you’re dirt poor you’re never going to believe you’re rich! Remember, affirmations should be super-specific and made in the present tense. You should feel inside as though they are true NOW! I have many affirmations I repeat to myself daily in a meditative state. (I will probably talk more about meditation in other articles). Here are two of my most successful business affirmations. I am enjoying increasing the passive income profits to my businesses. Secondly, notice I’m saying “I am enjoying increasing the passive profits to my business,” not “I am increasing the passive profits to my business.” I put that word “enjoying” in there because I don’t want to over-work. Remember, affirmations that are constantly stated are likely to come true. So make sure you affirm what you really, really want. Maybe I wouldn’t want increasing profits at the expense of working harder and harder. Thirdly, this affirmation is specific. It’s also achievable. I started making this affirmation when I was making passive income profits. Tiny profits! Maybe $40 a month! But I repeated this affirmation everyday for months and months until my business was making well over $5000 passive income profits a month. A bit of a mouthful that one! Notice that this affirmation isn’t selfish. It is always better to build your wishes around doing good to others. The crux of this affirmation is helping others. I want other people to enjoy the freedoms I have. I have gained financial independence by working for myself and freedom of time and location by earning passive income. Sure enough, almost every day, I get an email from someone thanking me for helping or inspiring them. I’m not making this up; they actually use the same words like “help” and “inspire” in their emails. It’s almost as if they know about my affirmation. I thought long and hard about writing this. But looking back over the last ten or fifteen years, I’ve found that my efforts in personal development have been super successful. And, remember, all my affirmations have come true, for better or for worse! So here are my rules for affirmations. I always practice gratitude at the end of my daily meditation and affirmation routine. I think about one thing in the previous day that I was grateful for: maybe someone smiled at me; maybe I had a great meal; maybe I was pleased about something that happened in my business; or met a great friend. It could be anything. Think of one thing that happened everyday that you can be grateful for. Gratitude is contagious. It grows within yourself as well as within the people you come into contact with. After a while you’ll find it easy to think of multiple little and big things to be grateful for throughout the day. Gratitude can help with depression, negativity, and general health and well-being. Gratitude is huge! You have to take this seriously for this to work. Repeating business affirmations about improving your and other peoples’ lives everyday, combined with other positive attitudes and habits, can only have a positive affect. I recently wrote a book called “Mind Freedom: Re-program Yourself for Success and Happiness with Meditations, Affirmations, Mindset Shifts”. It’s about business affirmations, meditation, positive thinking, and other personal development habits I adopted that all had a positive affect on my business and my life. If you’d like to read it on Kindle, buy the paperback, or listen to it, please click on one of the below links. Haha, I’m glad you’re affirming your affirmations, Jim. Iva, you got this! Thanks so much. So, so important Rob – and not woo-woo at all, either. Thank you for posting. We try to combine affirmation with business mission. Give highest possible customer service. Every day. All the time. It (coincidently) meets the rules you’ve set, but it also relatively easy to follow. It is also the direct correlation to our succes. So by implementing in our mission, we practice our affirmation all the time. It may sound hipster-like, but it works like a charm. It’s like Earl Nightingales Strangest Secret speech. Set a goal, and think of it. Anyway, stumbled upon your website and have now bookmarked it for a later visit. Have a great day, and continue your great writing. Hey Christian, great idea for an affirmation! They should be easy and effortless. Life and business works work when you want to do things. In your example, you love giving great customer service, and therefore your business thrives. Repeat this everyday and this will have a positive effect, I’m sure! Earl Nightingale, Napoleon Hill, Tony Robbins … everywhere you look in the world of personal development and business advice, you can see affirmations featuring strongly. Thank you for your comment and please consider signing up to my email list or enrolling in a free course. All the great achievers have always followed self motivation techniques or as we call it positive affirmations. We can see that especially in sport and in business. They executed and persisted because they believed in their vision. Insanely.. no matter what. Yup, because you believe you’ll achieve something, you’ll do what’s necessary to achieve it. Whatever you hold in your mind on a consistent basis is exactly what you will experience in your life!! !